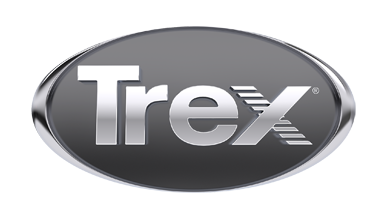 What are the minimum system requirements to run the Trex Deck Designer? About launching the Trex Deck Designer for the first time? Because the Deck Designer is built with state of the art technology, it may take 1-2 minutes to load the first time you launch it. However, subsequent uses will load much faster, and the tool is well worth the wait. You may also get a second popup asking if it is alright to disable DirectDraw. Select either Yes or No (based on your preference) to allow the tool to finish launching. The tool does not require that the sections be visited in order. You can visit, or revisit, any of the sections at any time and in any order using the header buttons on the navigation menu on the left. To advance, you would simply click the next header button in your current section. The Deck Designer can accommodate two levels in a deck design. No. The Deck Designer will not save an unfinished design. You will only be able to retrieve fully processed designs from your projects list when you return to the tool. In the project list, simply click on the red "Delete" button to the right of the project name. A project can be deleted even if the red triangle to the left of the project name is still rotating. Please be aware, though, that a rotating triangle indicates that the report for that project is still being generated. If you delete the project, the report will not be generated and the design will be lost. The Deck Designer was exited prior to completing the project. The project was completed and the reports viewed on the screen, but the "Print and Save Report" button was not selected and so the design was not processed and saved. There was an error in processing your design and the project was not saved. Unfortunately, the project can no longer be accessed. It is safe to delete it and begin a new project. No, the Deck Designer tool only operates properly with one instance of the application launched at a time. Trying to launch more than one instance at a time in separate windows or tabs may cause your browser to freeze. It looks like part of the tool may be getting cut off on my screen. What is the correct screen resolution to run the tool? The tool seems to be running slow (or is taking a long time to download). What's the problem? The Java applet window with the red progress bar seems to be locked up. How can I fix my Java plugin so I can use your Deck Designer? The Deck Designer will not run. I click on the Design Deck button and nothing happens. All I see is the "In Use" page. What's wrong? The Deck Designer will not run, and I have installed Java. All I see is a grey screen with a little box with an "X" in the middle. What's wrong? When I drag a drag-and-dropable item, such as a Planking Direction icon, onto the 3D preview, the item vanishes and so I can't add it to my design. What do I do? The tool is not responding. For example, when I click on Process Design, nothing happens. Is there a way to fix this? There are several factors that can affect the performance of the Deck Designer tool. Limited internet access (such as a dialup connection), older computers and graphics cards, and insufficient amounts of system memory can all result in the Deck Designer loading slowly and feeling "sluggish", slow to respond, or it taking a long time to process. First, be certain that there are no other instances of Internet Explorer running and that if you are running IE7 all other tabs are closed. Also, be certain that your system meets the minimum requirements. If these steps do not fix the problem, see "Uninstalling Java".. This often is an issue with your graphics card. Please be certain that you have the most up-to-date driver for your graphics card. See the manufacturer’s manual for updating your graphics card driver. Close and restart all browser windows, and try the tool again. In the Open field, type "dxdiag" and then click OK to launch the DirectX Diagnostic Tool. Click on the Display tab in the tool. Click on the Test Direct3D in the center-left portion of the tool to launch the diagnostic. I have reviewed the FAQs but my question has not been answered. What do I do? For questions about using the Deck Designer, send an email to: deckdesigner@trex.com. For product-related questions, check our Product FAQs or use our email form.